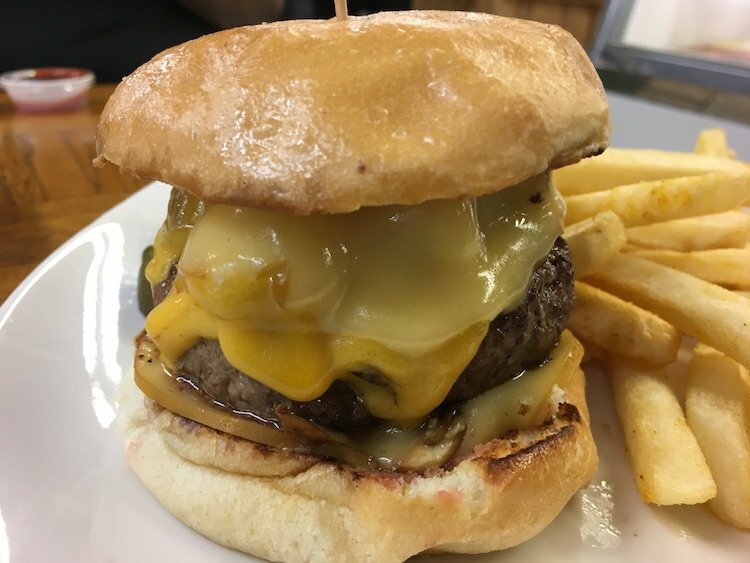 When I told George Motz (Hamburger Expert & director/writer of Hamburger America) I was in Lexington Kentucky for a few days he told me to rush over to Laha’s Red Castle Hamburgers. When he makes a statement like that it means its go time. Laha’s was only about an hour and a half from where we were staying so it was our first stop of the day. There’s probably a good 8 counter seats inside and lucky for us, they were all empty. I’ve read that it can get crazy around lunch time. I take a seat and instead of waiting for my wife Marcela and my bud John I order myself the Double Cheese Dipped Burger with some Onion Rings and a Chili Dog with Onions. The Dog isn’t so much a Chili Dog as it is living in a Chili bath. I drizzled some yellow Mustard on it and it was a tasty little ditty. They’ve been open and serving up Burgers since 1934 so you know something special is about to happen. The “Dipped” portion of my Burger refers to one of the buns being infused with some of their Chili Sauce. While it is referred to as a Double, it does not mean 2 patties but that the Burger is made up of 2 meat portions aka twice the meat of a single. The meat had a beautiful crust achieved only by an expert Burger cook. When you mix the Chili sauced Bun, Onions, Cheese, and Mustard into the equation you have what’s called a big-time winner on our hands. Marcela chose to have Lettuce & Tomato which pretty kills what makes this Burger so special. It’s old school and they don’t get made like this anymore. Unfortunately, she likes to eat her Burgers with all this filler which is never ending torment for me. The good thing is while she was eating hers I ordered and enjoyed a single Cheeseburger for dessert, the only respectable thing to do in this case.